Contoured mesh backrest moulds around user's spine to provide excellent comfort and ergonomic support. Fully height adjustable seat allows user to set to correct working height between 460-560mm. Raised 5 star nylon base with hooded swivel castors enable free movement around workspace. Foldable padded armrests support positive posture. Fully reclining tilt mechanism can be locked in the upright position. Waterfall seat front designed to reduce strain from knees and thighs. Choose between smart black, or vibrant red or blue mesh upholstery. Accommodates users up to 20 stone weight capacity. Suitable for 8 hours daily usage. 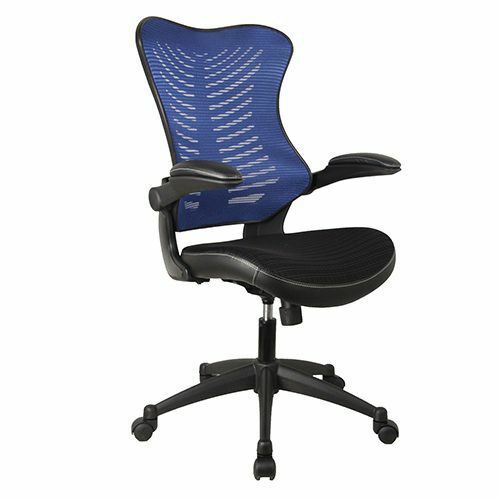 Mesh office chair with lightweight airflow seat.